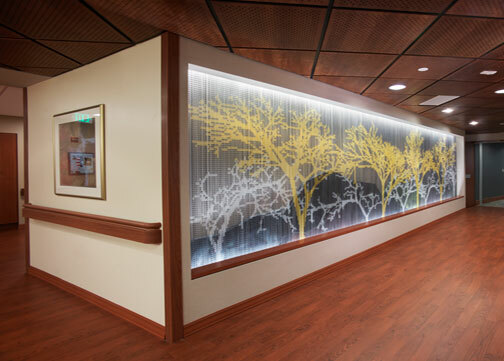 At the entry to the care unit, a transitional corridor with art feature enables vistors to psychologically prepare for seeing an ill family member as opposed to the elevator opening right onto the nursing unit with no time to emotionally compose oneself. On this floor, the art feature, 20-feet-wide, is a depiction of trees with a landscape of hills in the background executed in textured metals. The "trees" emerge from a series of chain link strands suspended from the ceiling. The links are in five colors of metal.